J. M. Ruiz; J. E. Guillén; A. Ramos Segura; M. M. Otero; O. Tello; M. A. Mateo; J. Bernardeau; J. L. Rueda; J. Urra; A. Mateo; E. Ballesteros; J. Templado; J. Romero; M. Pérez; T. Alcoverro; M. de Torres; M. Manzanera; R. Allué; E. Álvarez; A. M. Grau; N. Marbà; D. Carreras; J. L. Sánchez-Lizaso; Y. Fernández-Torquemada; A. Triviño; S. Jiménez et al. Knowledge of the distribution and extent of seagrass habitats is currently the basis of management and conservation policies of the coastal zones in most European countries. This basic information is being requested through European directives for the establishment of monitoring programmes and the implementation of specific actions to preserve the marine environment. In addition, this information is crucial for the quantification of the ecological importance usually attributed to seagrass habitats due to, for instance, their involvement in biogeochemical cycles, marine biodiversity and quality of coastal waters or global carbon budgets. 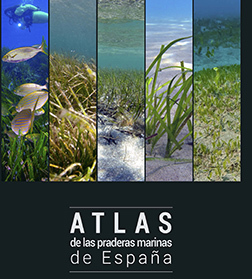 The seagrass atlas of Spain represents a huge collective effort performed by 84 authors across 30 Spanish institutions largely involved in the scientific research, management and conservation of seagrass habitats during the last three decades. They have contributed to the availability of the most precise and realistic seagrass maps for each region of the Spanish coast which have been integrated in a GIS to obtain the distribution and area of each seagrass species. Most of this information has independently originated at a regional level by regional governments, universities and public research organizations, which explain the elevated heterogeneity in criteria, scales, methods and objectives of the available information. On this basis, seagrass habitats in Spain occupy a total surface of 1,541,63 km2, 89% of which is concentrated in the Mediterranean regions; the rest is present in sheltered estuarine areas of the Atlantic peninsular regions and in the open coastal waters of the Canary Islands, which represents 50% of the Atlantic meadows. Of this surface, 71.5% corresponds to Posidonia oceanica, 19.5% to Cymodocea nodosa, 3.1% to Zostera noltii (= Nanozostera noltii), 0.3% to Zostera marina and 1.2% to Halophila decipiens. Species distribution maps are presented (including Ruppia spp. ), together with maps of the main impacts and pressures that has affected or threatened their conservation status, as well as the management tools established for their protection and conservation. Despite this considerable effort, and the fact that Spain has mapped wide shelf areas, the information available is still incomplete and with weak precision in many regions, which will require an investment of major effort in the near future to complete the whole picture and respond to demands of EU directives. Este título está en nuestro catálogo electrónico desde el Thursday 16 June, 2016.